Are you looking for a bed that can be foldable? When living in a small home that doesn’t have enough space for a proper bed, there is a solution for that. Using a folding bed, you can use the space at night by just rolling it out. With a rollaway and folding bed, you can easily open at night and fold them in the morning to save more free space. 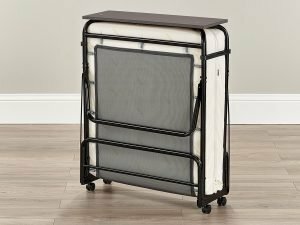 As always, this is my reviews of the top rated folding beds to help you select the right one for your small apartment. The best portable folding bed is a good alternative to the traditional bed. This folding bed is very ideal for regular contract use. The mild steel frame is well finished in durable epoxy paint. It comes with JAY-BE free lifetime frame guarantee for your peace of mind. Looking for extra sleeping accommodations when relatives visit on holidays? This Milliard Diplomat Folding Bed is highly recommended. For those who are oversized, this is the cot to buy. The extra width of this is welcome, the length is nice. This is another awesome folding bed You’ll love the firmness. It’s very suitable for most adults. In my opinion, the best folding bed should be: built to last, easy to carry and move around, not hard to assemble, strong and sturdy, and of course comfortable to sleep well. Folding beds are very popular in hostels where they are used in guest rooms. In modern apartments, the folding beds or rollaway beds (value for money) allow you to save money and space. With one of the reviewed small beds here, I’m quite sure that you’ll get a good night’s sleep. We help most people find the best products to make their home and life better and sweeter. We may earn a small commission for our recommendations or links to any products from this website, smallsweethome.com. written and reviewed with passion . © 2018 smallsweethome.com. All Rights Reserved. No part of this site may be reproduced without our written permission.